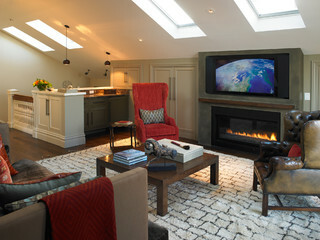 With a small house, a loft is a smart way to add living space or a storage area at minimal cost. They can be an attractive design feature as well. The goal of a small house is the creative use of limited space at the lowest possible cost. Since a loft is built in an area that is usually unused, it does not have doors and is not fully walled, it fits this objective. 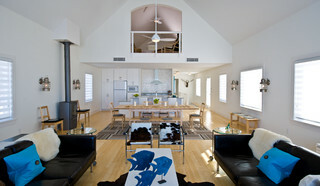 In a small house, lofts are usually used as bed area (rooms have doors). They are also used as an office, den, or gym, or all three. 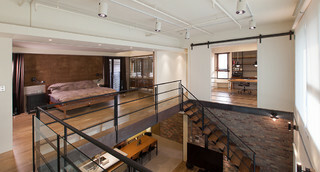 Generally, lofts provide a getaway space and a certain measure of privacy. If you’re making the transition from a big house to a small one and you’re still working on downsizing your personal inventory, a loft is an ideal solution for storage. I like the idea of using a loft for storage over an attic or cellar because they are easier to access, connected to the temperature control system, and equipped with lots of electrical outlets and good lighting. You’ll also have an incentive to get rid of your stuff because you’ll be rewarded once you’re done with a new living space! And in a small house, every square foot is highly valued. There is another way a loft can serve you. 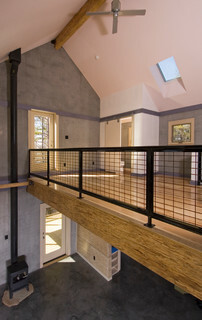 A loft can enable you to have a simple passive cooling system. If windows are strategically placed at the highest point possible, rising hot air can escape and thereby lower the temperature of the house. 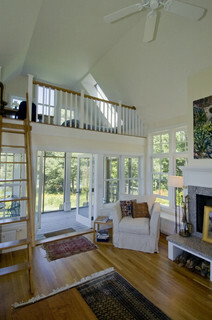 A loft provides access to these windows at a height that would be difficult or impossible to reach without it.